Thomas Bulkowski is a well-known expert on chart patterns. His book, Encyclopedia of Chart Patterns, is the ultimate reference book for chart patterns. 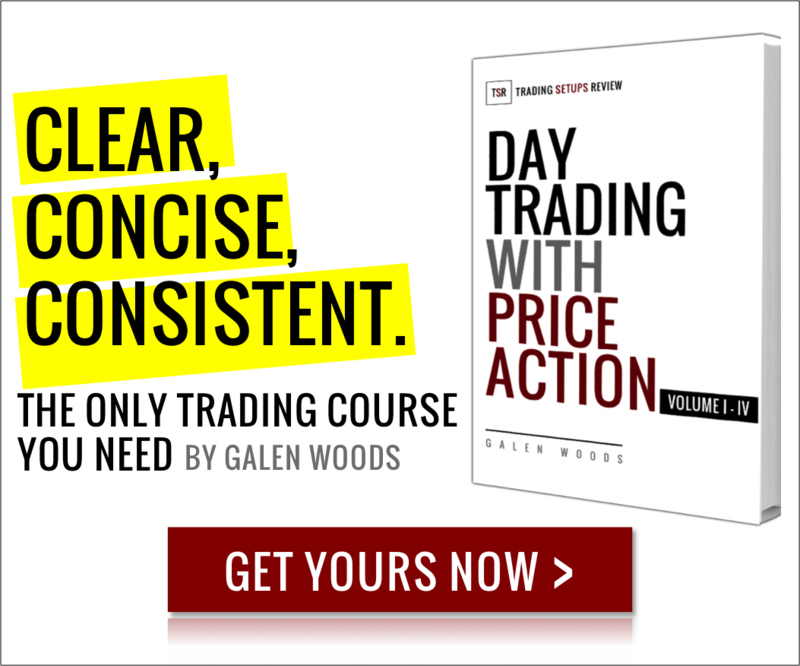 He has also shared some of his pattern research on his website, thepatternsite.com, where you can find this retrace day trading setup. This is a 5-minute ES chart showing the regular session. The day started off with four bullish bars before presenting a tweezer top. A sell stop order below the low of the bearish bar (red arrow) would have been triggered. Although prices stalled for the next 10 minutes, the trade quickly took off and gave us excellent profit potential. This trade is a textbook trade in many ways. 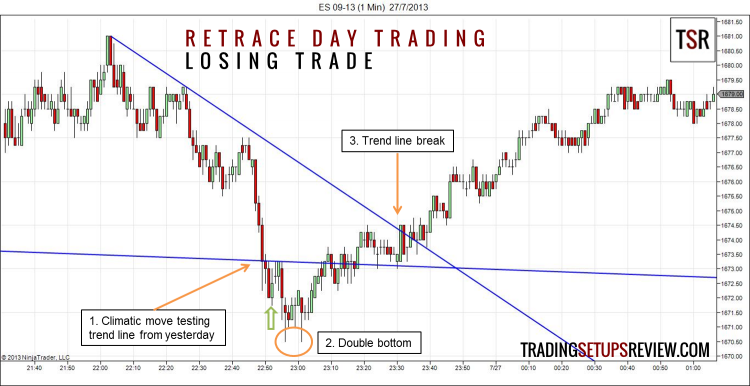 The day opened down, but prices quickly shot up to test the downwards sloping trend line. Prices bounced off the downwards sloping trend line from yesterday. Hence, this retrace day trading setup was also a trend line bounce trade. This trade, which came within 30 minutes of the session open, was a morning reversal trade as well. Do we need more reasons to take this trade? The low of the previous trading session was a good target price for this trade. If we intended to follow the recommended 50% retracement target, then we should not have taken the trade as the reward to risk ratio is rather poor. This is a 1-minute ES chart. Thomas Bulkowski mentioned that you could use this trade setup for 1-minute or 5-minute charts. The day started with some congestion followed by a false move up, before breaking down. We used Bulkowski’s retrace day trading setup to catch the bottom of this early morning down move. This trade failed and stopped us out. However, it quickly gave a second opportunity which turned out to be profitable. Here, it is what happened after the trade that’s noteworthy. A climactic down move tested a trend line from yesterday before setting up a retrace trading setup at the green arrow. (Pivots used for the trend line are not shown.) Hence, this setup looked promising. However, we got stopped out after a few minutes. After the trade failed, a nice double bottom formed with long bottom tails showing buying pressure. It presented an excellent opportunity to re-enter a long trade. This re-entry was at the low of the day and had the potential to capture the entire day’s range. Entering at the double bottom was rather aggressive. More conservative traders could enter after the trend line break. The retrace day trading setup uses pure price action to identify a trend, to enter the trade, and to exit the position. In this sense, it is an elegant way to trade. 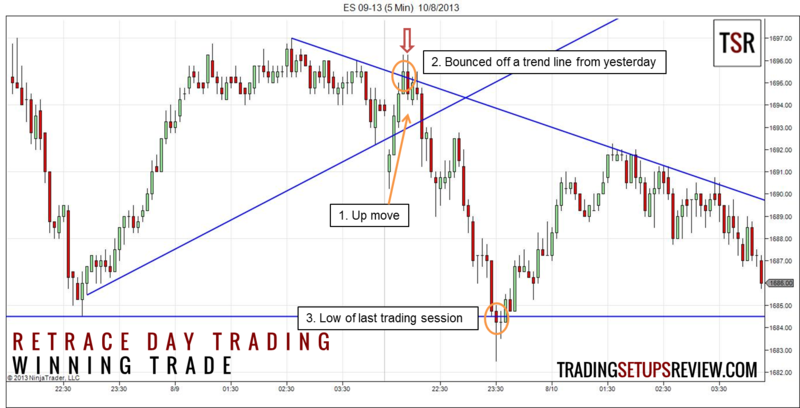 Together with trend lines from the previous trading session, this trading setup can be an excellent way to trade morning reversals. However, this trading setup goes against established momentum. There are two ways to improve the winning probability. First, check the trend on a higher time frame and trade in its direction. Second, identify climatic moves that have exhausted themselves. While a target of 50% of the prior move is suggested, I prefer to hold on and press on for a larger winner, especially when the context supports a significant reversal. You should refer to Thomas Bulkowski’s website; you can find more advice on this trading setup including how to manage the position.